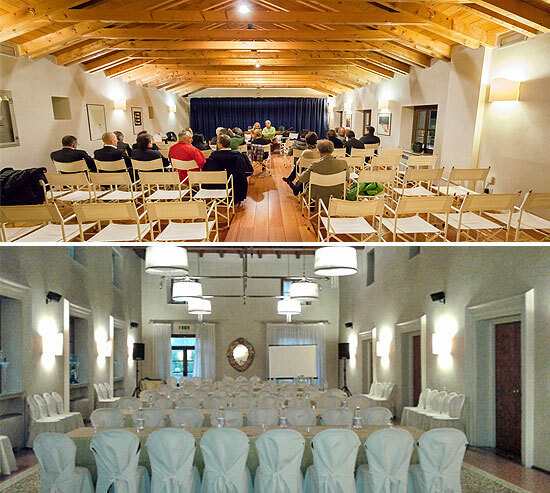 Our meeting rooms, located in the ancient Barchessa Villa Policreti, are equipped for meetings and corporate events of any kind. Different in capacity and architecture, versatile in staging , meeting rooms are immersed in a rare and precious context, an instrument of prestige and pride to customers, guests or representatives of companies interested in using them. Room Pordenone: up to a maximum of 40 people seated. Room Policreti: up to a maximum of 90 people. Room Father Marco D’Aviano: up to a maximum of 160 people seated.